Paula Mehok Putman receives the Goshen Neighbor on the Year Award in 2007. 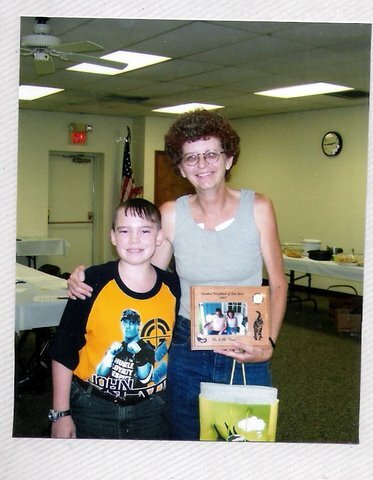 Paula Putman receives the Goshen Neighbor on the Year Award in 2007. She and husband Mark played a large part in the rescue of Jeremy White after he had a seizure. Paul and Mary Mehok moved to Goshen on May 21, 1954, after purchasing the property which was formerly the Pissocra’s Store. They settled here to be closer to Paul’s work at Warner and Swasey’s. Mary said they didn’t want to live in town. The couple had three daughters, Sharon, Paula and Amy. Paula and her husband Mark Putnam also reside on Goshen Valley Rd. in the house once owned by Carlo and Virginia Terazzi. Amy also lives on Goshen Vly. Rd. near Mary. Sharon (Freed) recently passed away after suffering with many health issues. She and her husband Bill (also deceased) have a son, Andy. Paul died on April 12, 1992 after a long battle with cancer. Mary later married Norman Stover, also of Goshen on May 22, 1994. He is now deceased.